Lady Lleraya Montclair is a Breton vampire and the daughter of Baron Wylon, the head of House Montclair. She has been tasked by her father to lead his armies across Rivenspire. While experiencing Verandis' memories, Lleraya can be interacted and spoken with. In the first memory she is at her mother's bedside, begging her to take her medicine. Lleraya Montclair: "Mother...please. You have to take the medicine. Reezal-Jul can help you!" Baroness Leila Montclair: "Oh, sweet daughter, I can't go on like this. I don't want to spend my final days as an experiment. Instead, let me spend them with the ones I love." "Verandis, you must tell me. Why did this happen to Mother? 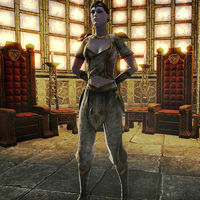 Of all the people of Shornhelm, why her? Please tell me there's a way to save her. You're powerful. You have to do something!" "I know you will. You've always been so gracious. A man who would do anything for those he cared about. I… no, now's not the time. We'll talk again later." 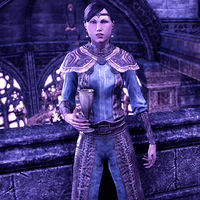 In the second memory, the group is celebrating Baroness Montclair being healed with the Ayleid relic. Lleraya is somewhat drunk. "Count Verandis. Hello. It's...um...good to see you. I hope you're well. What am I saying? Of course you're well! You're a vampire! Oh, sorry. Don't mind me. I must have had a little too much wine." You seem distracted. Is everything all right? "Right as rain, now that Mother's back on her feet. I was thinking… I wanted to find a way to thank you. For all you've done for us. Maybe next time you're in Shornhelm, I can make you a nice meal." Lleraya, you know I never eat… food. "I——oh! By the Divines! How embarrassing. Well, how about you feed on me instead? Oh! I can't believe I just said that. Pardon me while I slip away and find Reezal-Jul. Maybe he has a potion I can drink to make me forget this awkward moment." The third memory has the group climbing the up the Doomcrag in a bid to permanently heal the Baroness. Baroness Leila Montclair: "We shouldn't have left the guards behind, Wylon. Who knows what else we're going to run into?" Lleraya Montclair: "There was no choice, Mother. You're getting worse and we can't wait for them." Gwendis: "I'll stay here and protect the way out. Keep watch in case the guards catch up with us. The rest of you need to keep moving." Baron Wylon Montclair: "Thank you, Gwendis. At least you retain and sense of honor." Baroness Leila Montclair: "Wylon, you have to stop blaming Verandis. This wasn't his fault." Lleraya Montclair: "Come on! Mother doesn't have much time left." Reezal-Jul: "It's going to work, Baron. 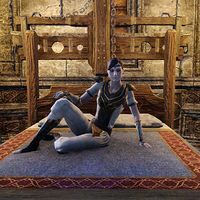 The power of this ancient Ayleid remnant...it's almost overwhelming." Baron Wylon Montclair: "The remnant will make you like new, my love! You'll be reborn!" Lleraya: "Something's …happening. I feel… the power!" Baroness Leila Montclair: "Wylon! Something feels… wrong…." Lleraya: "Father…what…what's happening to us?" Baroness Leila Montclair: "No! What…what have you done? This isn't me! I…I never wanted this!" "Please, Verandis. Help me! Make it stop! I…I can't stand the pain." "End this, Verandis. End this before I…arrgh!" "You'll pay for that, vampire! I have the power now. Nothing can stop me from reaching out and snapping…." "Well, well, well, you're not at all what I was expecting." Entering Dorell Manor, her voice beckons you to find her. "You might as well come up. I know that you're here. I can take your pain away… I can make you feel so much better…"
She is waiting for you, sitting on her bed. "Well, well, well, you're not at all what I was expecting. That makes this so much more… exciting." You can then talk to her. "Let me take a look at you. So you're the one who dispatched my father's pet Argonian? Well done, by the way. Well done. I'm so glad you're here. I was becoming dreadfully bored with Ellic and the rest of these silly nobles." Tell me why I shouldn't just kill you. "Isn't it fascinating? You want to strike me, but your weapon hangs loosely at your side. I wonder why that is? Oh, I know! It's because I will it. This is my world now. I feel your desire to please me, and I can use it to make you do as I wish." What are you doing to the nobles? "You believe the nobles are in danger? You want to save them? How sweet! They love me. They have given themselves to me. Thanks to the Remnant, I am their god. And now I also have you, the hero that Verandis presumed to use against my father and me." "You're trying to resist me? Oh, what sport we shall have! But first, I have duties to perform. Come, join me downstairs. We must attend the celebration. Perhaps I'll even honor you with the first dance - before you try to kill me." She then disappears. After breaking her spell with the help of Count Verandis, you meet her again in the throne room. Lady Lleraya Montclair: "As usual, Verandis once again ruins my fun… I guess I'll just have to destroy you now. Pity. But I can always get another pet." She will then become hostile and as she fights she will continue to speak with you. Lady Lleraya Montclair: "You hate me, don't you? Why does everyone hate me?" Lady Lleraya Montclair: "See how the people love me! They even share their life essences with me!" Since 2014, her original outfit as a vampire has been changed to something less revealing. This page was last modified on 24 March 2019, at 20:06.